How much money do we waste on food each year? Consumers in Wales will spend twenty four thousand pounds in their lifetime on food that they will never eat. This equates to around 15p in every pound you spend on your weekly trip to the supermarket, or each year around £480 for the average UK household, increasing to £680 a year for households with children – an average of just over £50 a month. However, environmental campaigners are saying that supermarkets themselves are needlessly throwing away around 1.8 million tonnes of food each year that is still good to eat, and that they need to do more. Charitable organisations like Bristol based Fareshare South West are trying to tap into this waste stream. They work with food distributors directly and receive weekly palettes of produce that never make it onto supermarket shelves. This food is often within date, and is returned because of packaging errors or over-ordering by certain stores. They then break down the food, including ready meals, fresh fruit, vegetables and cereals, and distribute it to 27 organisations which work with vulnerable people like drug addicts and the homeless. Jacqui Reeves, manager of operations for Fareshare, says they are only scratching at the surface in terms of how much waste supermarkets produce. Other people are taking advantage of supermarket throw aways for themselves. So called ‘Bin Divers’ monitor skips round the back of stores at the end of each day to see what they can find. Gareth Blake from Splott in Cardiff has been ‘diving’ for nearly two years. When asked why he shouldn’t pay for his food like everyone else, he said. 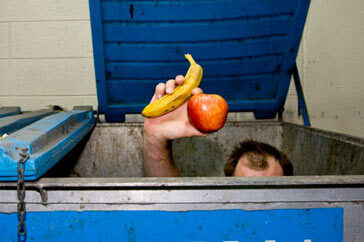 Finding your dinner in a skip is perhaps not everyone’s idea of a healthy balanced diet though. When posed with this, he was still resolute. 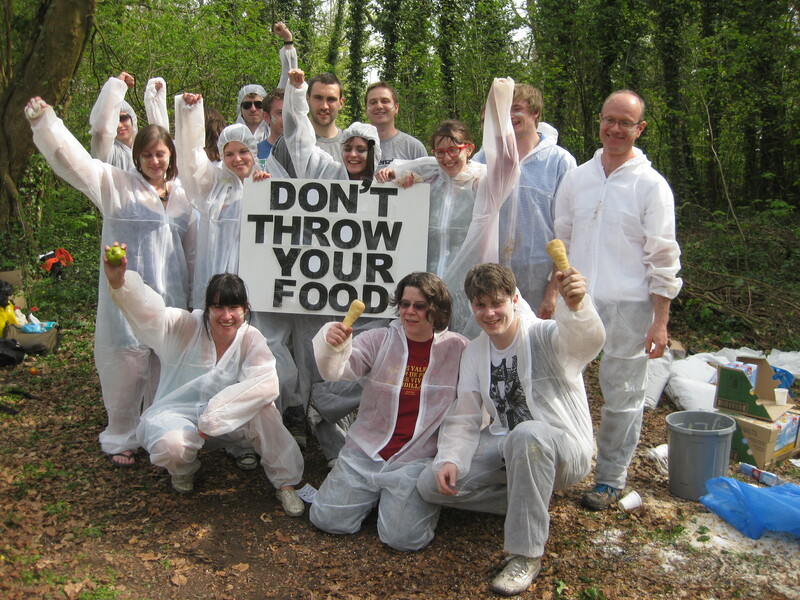 There are also an increasing number of stunts that environmental campaigners are pulling to try and engage the public in the food waste issue. Cardiff East Transition Group worked with Fareshare and bin divers to collect food for a mass friendly food fight. It might seem quite perverse to be throwing food around to highlight how wasteful we are, but according to organiser Tim Fisher, it’s not just about the serious message. Will landfill tax lead to higher prices? So three very different approaches to making the most of the food that never makes it into your shopping trolley. However with landfill taxes rising, the supermarkets may well be forced to clean up their acts and start reducing their waste – which means we might be getting higher food bills instead.